Lenna of Hobart is situated on Salamanca Place overlooking Sullivans Cove. Stroll through historic Battery Point village, visit popular Salamanca Place and market, meander around the waterfront and Constitution Dock or take a cruise on the Derwent River. Day trips to surrounding key visitor attractions include MONA, Mount Wellington, historic Richmond, iconic Port Arthur, Tahune Air Walk, and the many southern winery and vineyard tours. The Lenna guest accommodation wing comprises 52 spacious ensuite hotel rooms, including newly refurbished Mountain, Park and Harbour View rooms. 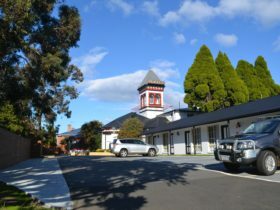 The rooms offer well-appointed living and superior comfort facilities with most rooms providing wonderful views of the magnificent harbour and river Derwent, majestic Mount Wellington, surrounding parkland and Hobart city. The Lenna King Harbour suites offer elegance and space overlooking the harbour and the two deluxe rooftop Penthouse apartments are the ultimate luxury with 360 degree view of Hobart. You will experience Tasmania’s rich heritage in harbour-side Battery Point. 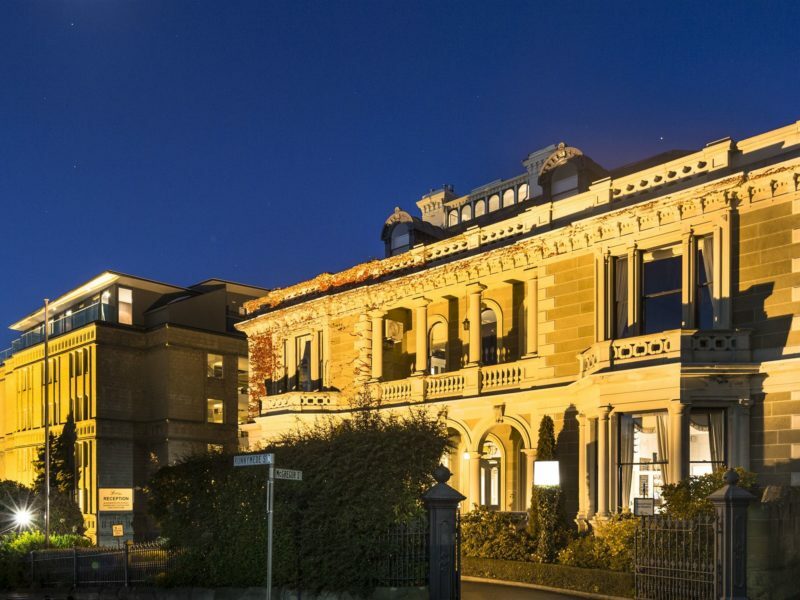 Built in 1874, Lenna is a magnificently restored sandstone mansion, classified by the National Trust and listed on the Tasmanian Heritage Register as a superb example of early colonial architecture, a Hobart landmark associated with Hobart’s early maritime and trading colonial history. North facing, Lenna King Suite with expansive views of Hobart’s magnificent harbour. King size bed, 46 inch smart television, free Wi-Fi and Foxtel, iPod dock, double glazed opening windows, Nespresso machine, two seater couch, table and chairs. 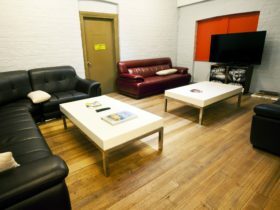 Spacious, two room suite with king bed (or two singles) in main area and a separate bedroom with queen bed. 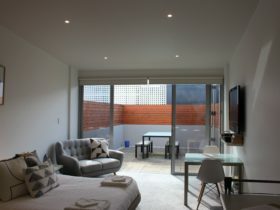 HD television with Foxtel in main room and bedroom. Complimentary Wi-Fi, double glazed opening windows, mini bar and tea and coffee making facilities. 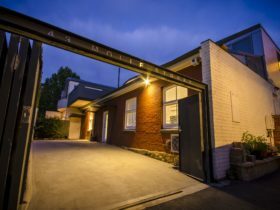 Modern spacious hotel room with spectacular views up to Mount Wellington and over Hobart. Queen bed, LCD HD television with complimentary Foxtel, complimentary Wi-Fi, iPod dock, double glazed opening windows, mini bar, tea and coffee, work space and two seater couch. The luxurious and exclusive Lenna Penthouses are set atop Lenna of Hobart. The panoramic views of Hobart city and the harbour from these rooftop apartments are simply stunning. Each two bedroom, two bathroom apartment has a modern, spacious lounge, dining, kitchen area with adjoining furnished balcony. 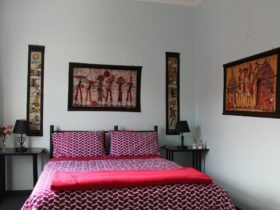 The main bedroom has one king bed and the second bedroom either a king or two singles. The main bedroom boasts an ensuite bathroom, the second bathroom also includes laundry facilities. There is an optional third bedroom and the two apartments can be joined to make a five bedroom Penthouse! Please note there is a strict NO PARTY POLICY and the apartments are not suitable for children 12 years old and under. Modern spacious hotel room overlooking magnificent Princes Park and Lenna gardens. 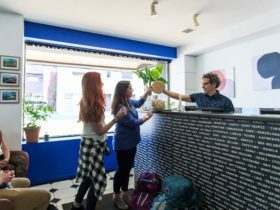 Queen bed and optional sofa bed, LCD HD television with complimentary Foxtel, complimentary Wi-Fi, iPod dock, opening windows, mini bar, tea and coffee, work space and two seater couch. 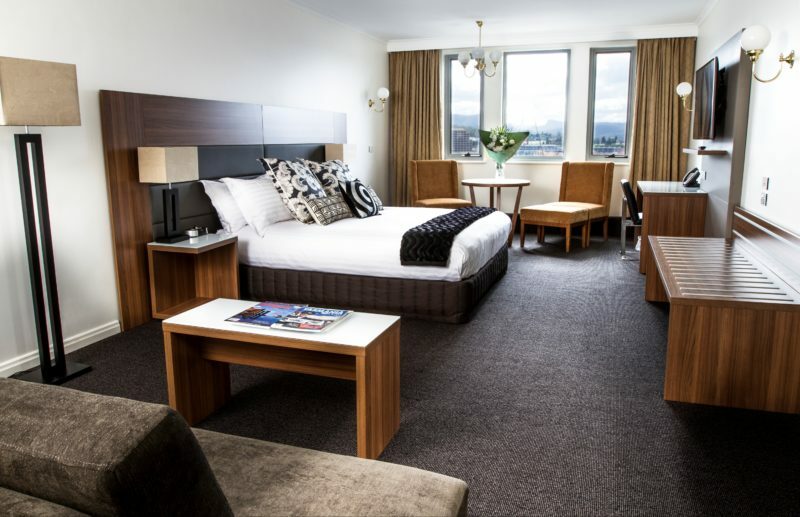 North facing modern and spacious hotel room with views of Hobart’s magnificent harbour. Queen bed, LCD HD television with complimentary Foxtel, complimentary Wi-Fi, iPod dock, opening double glazed windows, mini bar, tea and coffee, work space and two seater couch.